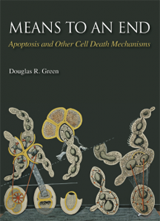 Cell Death and Differentiation – a leading journal in the field of apoptosis. The CASBAH – The caspase substrate database. Caspases.org – A free apoptosis newsletter. Cold Spring Harbor Laboratory Press – Publisher of Means to an End, CSHLP has published, scholarly journals, technical manuals, handbooks, popular books, and multimedia covering molecular, cellular, and developmental biology, genetics, and cancer research since 1933. Oncogene – Edited by Douglas Green, this journal examines the latest developments in cancer research.